Russ is the Natural Resource Manager for Hill AFB, Utah and has stewardship for 7 properties in 3 states totaling nearly 1M acres including the Utah Test and Training Range. He has 10 years of DoD experience, but also worked 13 years with the Utah Division of Wildlife Resources (UDWR) before his DoD Service. His last position with UDWR was Habitat Conservation Coordinator where he managed a $17M program and 35 employees throughout the state focused on habitat monitoring, research, and restoration. Russ received a duel major from Utah State University in Environmental Studies and Political Science (1993), then went on to earn his M.S. in Forestry and a Graduate Certificate in Natural Resource and Environmental Policy (2000). 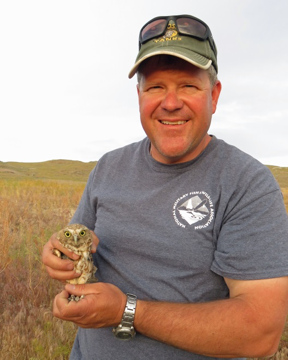 Russ has experience working in wetlands, forest, shrub steppe, and arid rangeland. He has conducted all types of wildlife and vegetation surveys and loves mentoring new employees and students. He has a passion for habitat restoration and has become an expert in both river and stream restoration and rangeland restoration. As he likes to say “if you build it, they will come”. Russ has served as President as well as Secretary of the Utah Chapter of the Wildlife Society, served two terms on the Wildlife Regional Advisory Council for the State of Utah, served as Chairman for the Northern Region Utah Partners for Conservation and Development, and continues to be a member of the Utah Steering committee for the Intermountain West Joint Venture. He loves being outdoors and participates in all kinds of recreational activities including mountain biking, flat water kayaking, skiing, fishing, hunting, hiking, and camping. He and his wife are the proud parents of 4 daughters that had no idea that outdoor activities and conservation ethics were actually choices until they were teensJ and by that time, they were already hooked!